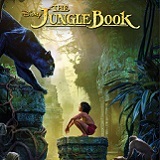 Directed by Jon Favreau (“Iron Man,” “Iron Man 2,” “Chef”) and produced by Favreau and Brigham Taylor (executive producer of “Pirates of the Caribbean: Dead Men Tell No Tales,” “Tomorrowland”), “The Jungle Book” is a live-action epic adventure based on Rudyard Kipling’s timeless stories, inspired by Disney’s classic 1967 animated film and centered on Mowgli (Neel Sethi), a man-cub who’s been raised by a family of wolves. But Mowgli finds he is no longer welcome in the jungle when fearsome tiger Shere Khan (voice of Idris Elba), who bears the scars of Man, promises to eliminate what he sees as a threat. The film’s musical score, composed by Emmy® winner and Oscar-, BAFTA- and Annie Award-nominee John Debney (“Elf,” “Iron Man 2”), features a classic orchestral sound accented by ethnic instruments and pays homage to the original film by highlighting snippets of the classic songs we all know and love. The Jungle Book is based on the works of Rudyard Kipling which spawned Walt Disney’s 1967 animated film of the same name. 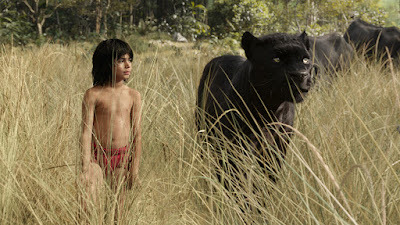 Mowgli (Neel Sethi) was abandoned as an infant and was found by the panther Bagheera (Ben Kingsley). Bagheera knew that Mowgli needed a people in order to survive so he entrusted him to the wolves. Mowgli’s mother wolf Raksha (Lupita Nyong’o) and father Akela (Giancarlo Esposito) loved him like he was their own cub. They taught him the laws of the jungle and the strength of the pack. During the driest season in memory, water levels dropped so low that the peace rock was once again visible. When drought revealed the peace rock, a water truce was called. Drinking comes before eating in the jungle, therefore all animals could drink at the river without fear of predators. Not all animals had seen a man cub before and many were curious about the boy being scolded for using human tricks to drink. As the tiger Shere Khan (Idris Elba) approaches, all animals are apprehensive. When Shere Khan gets a whiff of the man cub’s scent, he makes a threat. When the rains return and the rock disappears, he will take the boy. The wolf council is left with a tough decision. Is the life of the man cub worth risking the lives of the wolves and other animals that may stand in Shere Khan’s way? As the pack argues, Mowgli declares his intention to leave. Bagheera agrees that he should return Mowgli to the village of men. It is Bagheera’s belief that Mowgli will only be safe with his own kind. Shere Khan attempts to capture Mowgli on the journey to the village but is unsuccessful. Later he will attempt to draw Mowgli back home by threatening his loved ones. Shere Khan promises that all will know fear until he has the man cub in his possession. 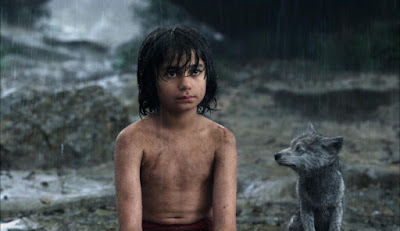 Before Mowgli realizes what’s been going on back at the Wolf Hills he called home, he ventures through the forest alone. There he meets an ominous snake named Kaa (Scarlett Johansson) who promises to help but clearly has bad intentions. A big friendly bear named Baloo (Bill Murray) saves his life. In return, Baloo asks for assistance gathering honey. They become quick friends and Mowgli considers staying with Baloo until the winter. Other dangers include the Gigantopithicus called King Louie (Christopher Walken). 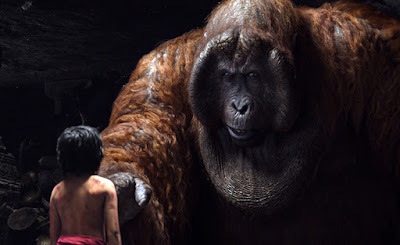 King Louie promises to be Mowgli’s people and keep him safe for a price. King Louie wants the red flower (fire) that only men know how to summon. 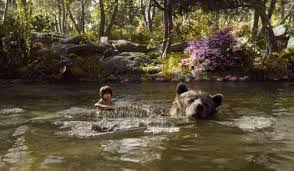 The Jungle Book is directed by Jon Favreau, who took great care to do justice to the film. It is a mix of the books and the 1967 film with a few new touches. Those new touches are well placed and add to the story. They do not take away from the beloved tale’s other interpretations. If you loved the animated Disney film, you’ll be amazed at what you’ll see with today’s technology. 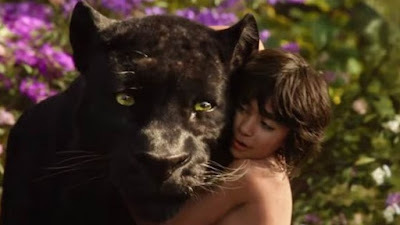 The character Mowgli is the only live action element which is utterly amazing given what you’ll see. The jungle, the animals, even the water was created in a computer although you’d never know it. Watching the supplemental features you learn how it was all done and that Favreau spent a great deal of time and money getting everything right. Instead of using a tennis ball on a stick like other CGI films have done, he had puppets created and even stood in for Baloo himself. Having Neel Sethi reacting to puppets and actors in blue suits gave true reactions and an authentic performance from the young actor. Voice casting is spot on with Bill Murray’s Baloo, Christopher Walken’s King Louie and Idris Elba’s Shere Khan selling the story. The film also features the late Garry Shandling as a funny porcupine, in what was likely his last role. The Jungle Book is visually amazing but also has a great deal of heart. The animals are incredibly realistic and you feel for each of them as they are in peril. There is a significant amount of violence, and although it isn’t particularly bloody, it may be upsetting to young viewers. My eight year old enjoyed the story, understanding that it is all make believe. When I saw it in the theater there were three and four year old children gripping their parents tightly. 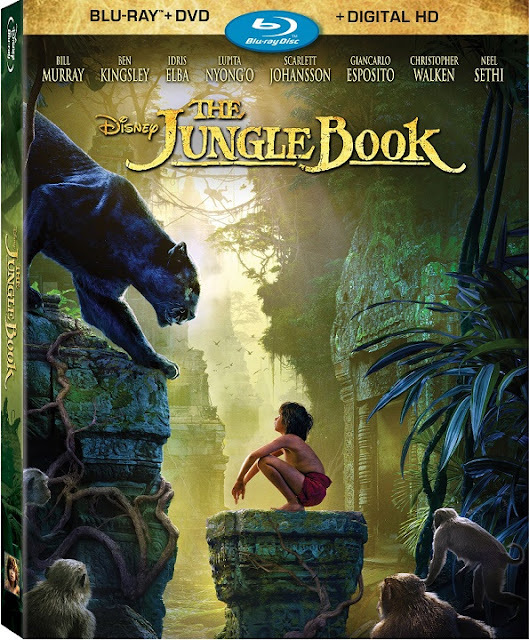 The Jungle Book is presented on Blu-ray in 1080p high definition with a widescreen 1.85:1 ratio. The level of detail is astounding. Every animal has different types of fur with even more variations in wet and dry coats. The environment is amazing and even elements like water and dust appear real. You could watch this film multiple times and still feel like you didn’t get to look at it all. The DTS-HDMA 7.1 sound is as impressive as the video. You’ll feel like you are in the middle of the Indian jungle immersed by the sounds of the creatures near and far. Directionality comes into play at Mowgli and the animals race across your living room. The film is well balanced and dialogue is always intelligible. The short list of extras contains lengthy well thought out features that are well worth the time. The Jungle Book Reimagined – The Director reflects on his experience from start to finish. Cast and crew interviews detail the very beginning, building the entire world, music, Disney history, honoring fans, easter eggs and more. Favreau’s ukulele skills are even seen in this bonus feature. I Am Mowgli – Director Jon Favreau discusses why Neel Sethi was the only choice for Mowgli after seeing over 2,000 child actors. Now 12 year old Sethi talks about his experience from the diaper/loin cloth to recording with Bill Murray in his home. The training and preparation is detailed and compliments flow both directions between Favreau and Sethi. King Louie’s Temple: Layer by Layer – Richard Sherman meets the Orchestra that will bring to life his song. Watch Christopher Walken record that icon tune, with art work and images at various stages of completion. Audio Commentary – This is a rare occasion where the Director can solely carry a feature length commentary track. Favreau provides filming anecdotes, explains how various shots were accomplished. He discusses his previous resistance to CGI and recalls memories of working with the late Garry Shandling. As someone that loves the original animated film, I couldn’t imagine that The Jungle Book could be translated well into a live action movie. Director Jon Favreau went to great lengths to ensure a realistic movie, even though primarily computer generated. Additionally he went above and beyond as a Director to draw out a genuine performance from the young actor that played Mowgli. The supplemental features are profoundly interesting and the audio and video quality are spot on. This Blu-ray set should be added to the collection of every family, with a warning to young ones that the film can be a bit intense. Highly recommended.